Only Settle for the Best, GET . NEW Our new authentic engine sound for your Nautilus submarine..
Robby the Robot Life Force Model# S-RR-S-KIT is a complete Plug-n-play LED and Sound effect kit that speaks 14 famous phrases in sync with a flashing Blue LED. Other lighting effects included. For your 1/12 scale Polar Lights Robby the Robot Model. NEW! Ultamite Robby the Robot 2.0 Life Force KIT is a complete Plug-n-play light and Sound effect kit that speaks 14 or 21 famous phrases in sync with Blue Voice box for your Masudaya 16" Robby . Movie accurate effects for all lighting. Must see video and photos. Premium and Ultra Premium versions available. NEW! 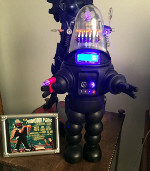 Ultamite Robby the Robot 2.0 Life Force KIT is a complete Plug-n-play light and Sound effect kit that speaks 14 or 21 famous phrases in sync with Blue Voice box for your Masudaya 24" Robby . Israel Rosario's Robby the Robot Custom build Services. Have a Robby built up for you.. NEW!! Plug-N-Play light kit for the Moebius Pocket Spindrift from the 1960's Irwin Allen Hit Series " Land of the Giants,"
NEW!! Plug-N-Play Kit for Gort from the movie "The Day the Earth Stood Still". Amazing Lights and Sounds. Take control of your C-57D with our all new Custom Engine Sound Board. Three controls for Take-off, Inflight, and Landing sounds. WOTW War Machine Life Force Kit was designed for the Pegasus 1/48 scale Martian War Machine provideing lights and sounds for one of SciFi's most iconic space crafts ever filmed. This kit provides the most amazing effects available anywhere. See Videos.